Votes of Russian Jury Announced by Arina Sharapova: Cyprus 1, Greece 2, Austria 3, Turkey 4, Ireland 5, France 6, Italy 7, Spain 8, Slovenia 10, UK 12. Officially National Jury made of: Yuri Saulskiy, Maksim Dunaevskiy, Aleksandr Koutikov, Yuri Aksyuta (Europe Plus), Sergei Arhipov (Russian Radio) have listened to 53 submitted entries - exctracts of which even were put online at the website of "Programma "A", though they were not connected directly to preselection this time. Among candidates were traditionally "Nogu Svelo", Zhanna Dobrovolskay, Andrei Kosinsky and other lesser known performance. As head of Jury Konstantin Ernst reported, as the result of the voting of Jury second place with just a few points difference from winner was occupied by "Angel" song by duet "Chai vdvoem". Alla Pugacheva: Origianally I shouldn't perform this song at Eurovision. I was only due to go there as composer, but the male singer who was due to perform the song (if you noticed it has male lyrics, but thankfully, they can be also performed by woman) felt ill and couldn't sing. I was hopinh for a beautiful male vocal. But I had to perform it myself. Though that was quite strange for me to perform this song. And I was thinking whom should I devote it to perform it from the whole soul? And I couldn't find better candidate to be called Primadonna than actress Lyudmila Gurchenko. I had no other image in mind. I looked on all the shootings of Bondarchuk and understood she is real Primadonna. I didn't want to sing about opera or theater, and this is the very synthez of the star and primadonna in that show, where I wanted to see myself and others in future. And when I imagined that it becamy much easier to perform lyrics which were originally written as man's song to woman. Despit popular rumours that singer mentioned by Alla is Nikolay Noskov (who has released his version of Primadonna in his albums Paranoia, Stekla i Beton, Okean lyubvi, Best songs), it was not him, but Valery Meladze. "Alla Pugacheva is Queen of Russian Pop music. She has become the last People's Artist of USSR during Gorbachev's preiod and first singer of Russia which judging on the number of sold CDs (150 millions) can be compared with Bing Crosby, Elvis Presley and Michael Jackson"
When Alla was asked what she thinks about other participants, she said she never heard any names of them, as they all are new artists on the stage. She decided to work with Swedish conductor, but explained that not as she was not able to find Russian one, but as it was interesting to work with different people. She added that the most important thing for her is to get maximum satisfaction from the music. My arrival to the Eurovision was shock for everyone. I was not in Europe for some period and decided to check my popularity there. It appeared that I'm still remembered and my song (not the best I ever performed actually) was adding popularity every minute. You can not even imagine that bookmakers put "Primadonna" on third place, right after Italy and UK. Everyone was understanding that it is real claim for the win... and they got afraid. We had mixed all cards for them. So they have to shuffle the votes in their favour, but that is not the most important thing. They still remember me and my song, I was the most popular person among journalists. I was like Fellini there. And I was not looking for the good place. If I wished to win I could make it for sure. And about contest dress, I had another very luxurious one, but I after looking at recorded rehearsal video decided that I look fat in it. So I decided not to risk and I appeared in my casual dress, same one I used on streets. I was real winner of the contest. I don't speak about the formal result, but the way it was really felt. English singer was rather good one, and I was second favourite, only because of Russian language of performance. But we knew from the beginning that they don't want us to win. Usually Germany, Russia never win there, and it is good, as they themselves never need the win. But we needed it. Of course I went there to do some sort of promotion. I never expected such a great reaction from the people. Only for this reaction I had to go to this contest. Not to invent something, I'm not insidious, but I'm clever. Contest can not be without people who are dissatisfied by the results or offended. My God, I performed the best of all singers - that is what I thought. But contest is chance to perform, to show yourself. If you will sacrifice life and relations with composers, with whom you have been working for many years, and will show your individuality, you will be recognized and loved. Now, all journalists and fans call me primadonna. That is the biggest award artist can dream of! For me title of the song "Primadonna" gave new start of image and everything. And really, whether I'm not real Primadonna? "Arguments and Facts" newspaper issued very critical article, where openly asked question "What for Pugacheva and why her went to the contest? Was it what singer who is on holidays for 2 last years wanted herself?" One of Jury members critic Artemiy Troitskiy spoke out in same newspaper: "I was among the people selecting contest entry for Eurovision. And I was against sending Alla to this contst, because it is contest only for performers of 3rd-4th class. Yes, ABBA really got famous with Eurovision participation, but this was back in 1974. Performers like Elton John, Kate Bush, Milene Farmer, Charlez Aznavour never participated and will never be in this contest as it is not their level. The decisive point was ambitions of Kirkorov and Ernst who persuaded poor girl to go there. Problem was that there was no single good song in the contest. 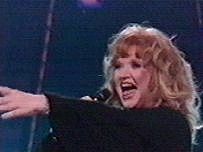 And among all this rubbish Pugacheva was like Everest among Russian mountains... Her lose is not connected with Russian language at all. Simply Eurovision contest has it's own clear style and format, to which Alla is not fitting at all. It won't be fare if because of failure in the contest anti-Russian language campaign will be started. We have to blame now only ourselves. That's it. " Famous businessman Lisovskiy in Komsomolskaya pravda newspaper: It wasn't my project, and I didn't wanted to to there, to give some advices, to try to persuade not to do this, no - but in private talk with Alla, I told her that Eurovision is festival of youth and participation in it of the Star of her status is quite nonsence..."
a) our PRIMA went to the wrong place. It was mentioned by commentator of British TV, when he said: In the contest of young singers participates young Russian performer, ha-ha-ha, sorry..."
Alla Pugachova was born on 15th of April 1949 in Moscow. In 1965, during radio show "Good morning" Alla, who at that time was still schoolgirl, performed song "Robot". She has graduated from conducting-choir department of Moscow State Music College and in 1981 she graduated from directing faculty of GITIS. Then for number of years Alla performed with number of bands, like VIA "Noviy Electron", "Moskvichi", Oleg Lundstrom's orchestra, VIA "Veseliye Rebyata", "Rhythm" band. In 1975 at "Golden Orphei" festival she got Grand-Prix for the song "Arlekino" and in 1978 at contest "Sopot-78" Grand-Prix for the song "Kinds can do everything". In 1977 she debuted on screen in movie "Woman which sings", which become a big hit among the viewers. Other movies like "Season of miracles", "I came and I say", "Love for the love" and others. In 1988 Alla Pugachova creates own studio "Song Theater" and promotes different performers who in future have reached star status, as Phillip Kirkorov, Vladimir Presnyakov, Arkadiy Ukupnik, Tatiana Bulanova. Though in 1995 Alla after successful tour "Star Summer" decided to leave the stage, she returned with triumph in 1998, with conducting successful concerts in 45 cities of Russia and CIS. At the present time continues her career, and produces new performers, also being director of reality show Stars Factory 5 (Fabrika Zvezd). Bravo, primadonna, bravo! "Diva Prima Donnа"
Chante en femme blessee, allez chante! Arrangement: Ruthger Gunnarson, recorded at KMN studio AB, Sweden. Produced by: Konstantin Ernst and Philipp Kirkorov.